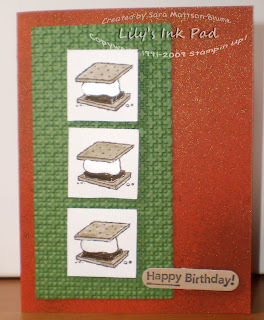 Lily's Ink Pad: Yummer Summer Nights! Now, this photo doesn't really show it, but the marshmellows look glassy, like real ones do after melting, because I used my Smooch on them. Easy, fun, and cool, and an not-girly way to use a girly product! Mmmm, S'Mores! Love that card, very cute. Love the title - how cute!